STOCKTON - Fresno's Cody Gerhardt is on a surprise roll. The United States Auto Club Western Classic Racing Series driver passed teammate Tim Skoglund midway through the 50-lap main event and pulled away for the victory Saturday night in front of an estimated crowd of 500 spectators at the Stockton 99 Speedway. 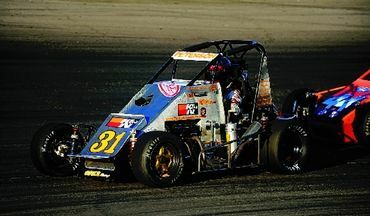 USAC's Open Wheel Night at the speedway featured Sprint Cars, Western Midgets, Ford Focus Midgets and Junior Focus drivers. "I still can't believe it," said Gerhardt, whose victory is his second in a row following a win at Salt Lake City last week. "My car got looser later in the race, but I was able to hold my line. I was nervous because I wasn't sure how good the cars were behind me." One of the racers tracking Gerhardt was Lincoln's Tony Hunt, a six-time USAC champion, who failed to finish in the top five Saturday. Manteca's Nick Chivello took the lead on the first lap from the second row and led all 30 laps in the Sprint Midget main event to hold off the top qualifier Scott Pierovich of Alamo. "I saw an opening off turn two that (Scott) and I both went for," Chivello said. "I went into turn four and I didn't think my car would hold but the car stuck and I powered it from there all the way to the finish." It was the second career win in the midgets for Chivello, a third-generation electrician who said he has been racing since he was 5 years old. He credited the win to his father, Dan Chivello, and Mike Wilke, who worked as his crew chiefs. Sacramento's Garrett Peterson won the Ford Focus Midgets 30-lap main event from the pole position, but had to hold off a tight pack of drivers. Brodie Kostecki of Perth, Australia, briefly grabbed the lead on lap 10, but Peterson took it back two laps later and held it for the duration. Jessica Clark, the national USAC points leader out of West Lake Village, nearly took the lead on a restart on lap 20, but had to settle for second. "I was able to keep my car low (in the turns) to hold off Jessica," Peterson said. "She's a great driver who drives hard and clean." Trevor Hunt, a 12-year-old from Kansas City, Mo., took advantage of his front-row starting position to lead all 20 laps in the Junior Focus main event. He earned the trophy dash victory as well for the sweep. Skoglund, of Fresno, took the checkered flag in the Sprint trophy dash, San Carlos' Chad Nichols won the Midgets dash, while Kostecki earned the victory in the Ford Focus dash. The speedway hosts racing next Saturday with the Whelen All-American Series featuring Late Model twin 50s.